Please read these terms and conditions carefully. Viewing and or purchasing from this web site implies your acceptance of the Terms and Conditions contained within. If you do not wish to accept and abide by these conditions please discontinue use of this site. 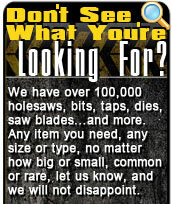 Holesaws Unlimited Inc. is a discounted distributor of various drills, taps, cutting tools, and other products. Due to the nature and spectrum of application and use of said products, Holesaws unlimited Inc. assumes no warranties, expressed or implied, nor product fitness for a particular use. By purchasing these items under these guidelines the purchaser accepts that Holesaws Unlimited Inc. shall not be held responsible for any punitive or cumulative damages which may result from the use of this site and or products sold herein. The purchaser and or user of these products, accepts and understands the inherent dangers associated with the application and use of said products. The purchaser accepts that Holesaws Unlimited Inc.'s maximum liability is limited to the price of the item or items purchased. The purchaser agrees categorically that Holesaws Unlimited Inc., it's officers, directors, shareholders, and representatives shall accept or assume no liability for any direct or indirect, actual or assumed, immediate or consequential damages punitive or otherwise assigned to the use of this web site or the products contained herein. Holesaws Unlimited Inc. retains the right to cancel any order at any time with no assumed liability. Holesaws Unlimited Inc. strives to maintain the accuracy of site "content and price accuracy" however we are not responsible for typographical errors. Holesaws Unlimited Inc. is a United States based company. Any and all transactions are completed in U.S. currency. 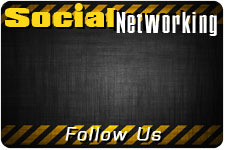 Web site prices do not include shipping and handling charges and or sales tax where applicable. Charges for shipping and handling as well as applicable sales tax will be posted on the customers invoice. Holesaws unlimited Inc. is not responsible for any for any import/export fees, taxes, duties, tariffs, and or other expenses incurred as a result of international shipping. Holesaws Unlimited Inc. reserves the right to refuse any order, cancel any order, and or limit any quantities for any reason. 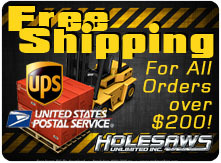 Holesaws Unlimited Inc. ships via UPS ground unless otherwise requested by the purchaser. We employ a "flat rate" shipping and handling fee of .75 for shipping and handling for orders shipped via UPS ground anywhere in the Continental United States. This rate applies to orders up to and including 75 pounds. In cases which purchaser requests express shipping, the purchaser may arrange such delivery by calling Holesaws Unlimited Inc. directly at (516) 442-1053. To put it simply, if we screwed up by incorrectly filling and shipping your order, call Holesaws Unlimited Inc. directly at (516) 442-1053, speak to one of our representatives and we will do our best to expedite delivery of the correct merchandise at our expense. Otherwise, Holesaws Unlimited Inc. will accept no returns and issue no credit without issuing the customer a return authorization number. This authorization number may be attained via e- mail or telephone and is issued at the discretion of a Holesaws Unlimited Inc. representative. 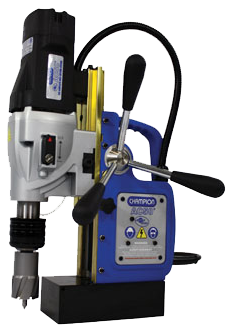 After attaining a return authorization number, the purchaser is responsible for shipping charges to return the unused, unopened, item in new condition to Holesaws Unlimited Inc. within 30 days from date of purchase. Holesaws Unlimited Inc. will credit the account minus the shipping and handling fees. No re-stocking fee will be applied. Holesaws Unlimited Inc. accepts Visa, Mastercard, and Discover Bank Issued Debit Cards are also accepted. Checks are accepted however delivery will be delayed until the check has been cleared. 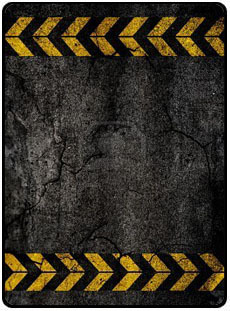 Any and all logos, web design, and graphics contained within this site may not be reproduced without the written permission of Holesaws Unlimited Inc.
Holesaws Unlimited Inc. is a New York State corporation. By using this site you are accepting any and all legal jurisdiction pursuant to New York State law.